BEHRINGER goes wireless at a performance level and price that's unheard of! With the revolutionary ULTRALINK UL2000B true diversity headset system, you will experience one of the best performing and innovative designs available in this segment. Choose from 320 transmission frequencies and enjoy the powerful advantage of simultaneous operation for up to 20 systems. * The IRC compander guarantees incredible dynamics and low noise. You get an excellent headset microphone perfect for vocal applications, featuring a Panasonic condenser transducer. With its user-friendly control menu and comprehensive LCD screen, the receiver is extremely easy to operate. 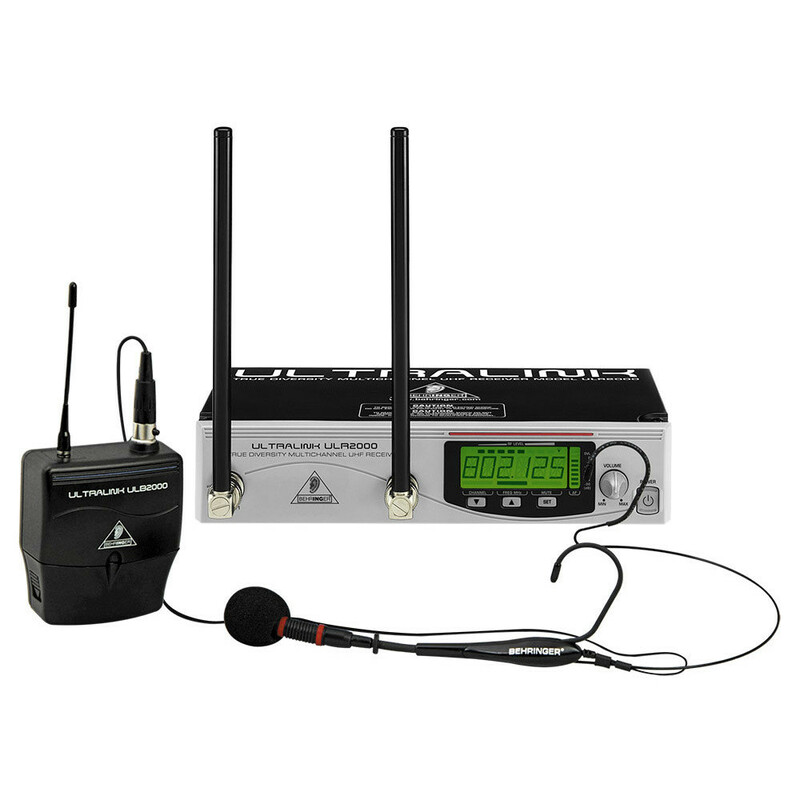 One of the ULTRALINK highlights—a feature never seen in this price range—is the availability of user-tunable transmit frequencies in addition to the 3 presets with 8 interference-free channels each. This way, you have a total of 320 different frequencies available to you, ensuring that you will find a free frequency, no matter how crowded it gets! The receiver also features a switch-mode power supply with easily interchangeable AC plugs for maximum flexibility (100 – 240 Volts). The ULTRALINK ULR2000 true diversity receiver easily fits into your 19" rack and can be mounted with the included rack-mounting kit. Go wireless—with the latest breakthrough in technology and pricing! * Number may be limited to specific laws of the regulatory authority for telecommunications and broadcasting. All trademarks (except BEHRINGER, the BEHRINGER logo, JUST LISTEN, IRC and ULTRALINK) mentioned belong to their respective owners and are not affiliated with BEHRINGER.